The December 2013 update to ArcGIS Online included new features and important enhancements for authoring web maps, configuring apps, administering your ArcGIS Online organization, and more. With the new Find Existing Locations analysis tool, you can query spatial and nonspatial attributes in your data. You now have the ability to copy a layer in your map; configure different properties on the copied layer, such as pop-up windows and symbols; and save the layer as a new item. You can also save layers imported into your map, such as CSV files and map notes. Administrators can configure the default map units for the scale bar, measure tool, directions, and analysis. ArcGIS Online members can set the units they see through their own profile page. More options to change symbols have been added, such as rotating point symbols, normalization of your data, changing the width of lines, and the ability to use size to display a graduated point symbol over a polygon. Time-enabled layers now include an option to disable the time animation so the time slider does not appear on the map. Map authors can choose whether or not to allow others to save a copy of their map. A simplified map viewer opens if a user is not signed in. This makes it easier to explore maps for casual, anonymous users. The simplified viewer includes tools to show tables, edit features, change symbols, share, view data through time, and so on. On the public ArcGIS Online map viewer, authoring capabilities, such as adding layers and configuring pop-up windows, can be enabled by clicking Modify Map next to the Sign In button. There is no option to save the map unless you are signed in. The Modify Map option does not appear in the map viewer if a map author has enabled Save as protection on the map. For organizations that allow anonymous access, a simplified map viewer opens, but there is no option to modify the map (users must sign in to see all the tools). App template code can now be downloaded from GitHub so you can use it to create customized apps that are hosted on your own server. You can now create configurable apps and group gallery apps from Esri-featured app templates in the Gallery. The Basic Viewer, Social Media, Legend, and Panels Geocoder templates now show a list of suggestions as you type in your search term. The GPX template has been retired from the Esri default map viewer template gallery. You can still use retired templates to create and publish apps by sharing them (and any other Esri template) to your custom template gallery. The profile template has been updated with the latest ArcGIS Online Elevation profile service, which is free. This worldwide service is based on the GEBCO data at 30-arc second (approximately 1,000-meter) resolution and worldwide between 60 degrees north and 56 degrees south based on the 3-arc second (approximately 90-meter) resolution Shuttle Radar Topography Mission dataset. In the continental United States, the service is available at 10-meter and 30-meter resolution based on the US Geological Survey National Elevation Dataset (NED). Spatial Analysis—With the Enrich Layers tool, you can now select a group of data variables (data packs) or individual variables from each group. You can map the results from the Summarize Data tool using the new proportional symbols and get better visual clues for understanding your organization's data. You can use the Extract Data tool to export a CSV file of feature attributes from area and line layers. We've also added a new tool, Find Existing Locations, which allows you to query both spatial and nonspatial attributes in your data. And finally, you'll now see the consumption of service credits ahead of time for Enrich Layers and Create Drive-Time Areas. Network Analysis—We've reduced Multi-Vehicle Route service credits usage by 50 percent. Content has been updated and enhanced for India and Thailand. Live traffic is now available for visualization and analysis in Argentina. The Location-Allocation service is in beta. Developers can include this service in their applications, and ArcGIS for Desktop users will see it as one of the ready-to-use services. There is an option to use live traffic in the Directions tool, including Drive Time Areas, Finding Nearest, and Summarize Nearby. 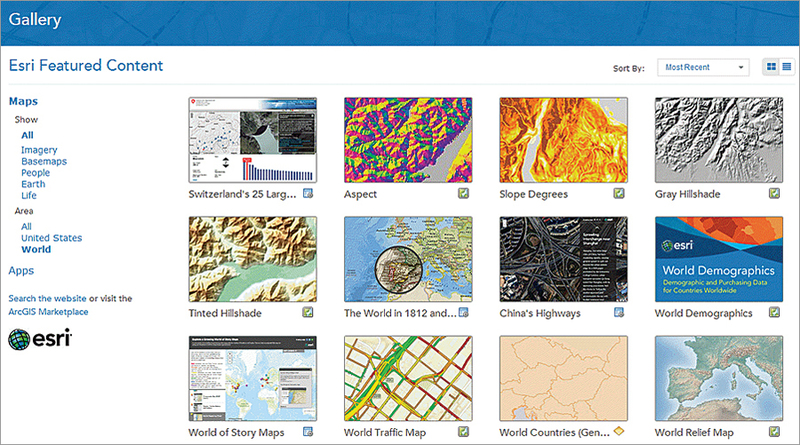 To make it easier to manage your ArcGIS Online subscription, we have added a number of enhancements. You now have the ability to use your own custom geocoding services to find places and addresses. Custom geocoders can be useful for batch geocoding or geocoding your own data. We also added a setting for the default basemap in the map viewer to open at a default extent set by the organization. And you now have a setting to add Esri basemaps and templates to configure groups so you can automatically include the Esri default basemaps and default templates. We added a custom contact link in the footer of your ArcGIS Online website. Under My Organization, administrators can now see the date when members last logged in. Administrators also have a new tool for resending and removing invitations and disabling member logins. Several enhancements have been made to the Esri CityEngine Web Viewer. Search has been improved to deliver search results faster, and results are now highlighted in the 3D view. We also added new search tokens for attribute filtering, a new screen shot tool, and a new dedicated comments pane with filter for author and nonauthor comments. The Share dialog box has been improved. Experimental support for Internet Explorer 11 has been added. Now there is an easy and fast way for you to view your favorites and find featured content from your organization and Esri in the Gallery. Geocomments created by the web scene author in the CityEngine Web Viewer that are symbolized differently can now be displayed independently of other comments. You will also see faster performance when working with scenes that contain many features. The Gallery has been redesigned so that now you will see an Esri featured content section, as well as your organization's own featured content section. In addition, ArcGIS Online for Organizations subscribers will now see items they've designated as a favorite in their My Favorites section. The Gallery also includes better tools for sorting and filtering items. You can add items to your favorites that you find in search results or the Gallery or that you've added to your content. You can view your favorites in a new My Favorites section of the Gallery and search your favorites to add layers to your map. In addition, when adding layers to your map, you can search for layers from your favorites. You can change the URL of an ArcGIS for Server service layer you've moved to a different server by editing its details. When you add a CSV file to ArcGIS Online and share it with everybody (public), the details page now displays the URL. You can then use the URL to reference the CSV file as a layer in web apps, pop-up windows, and so on. Item details now include an option to protect against deleting the item. And now you can store items with the same title in the same folder. Two new regions have been added: Greece and South Africa. Help has been reorganized to better highlight the main workflows of ArcGIS Online. This is part of an ongoing effort to improve the usability and attractiveness of the site. MapmyIndia—ArcGIS Online basemaps for all of India were updated in January with content from MapmyIndia at scales from ~1:288 k to ~1:4 k nationwide and at ~1:2 k and ~1:1 k in urban areas. We are working on providing complete nationwide coverage at zoom levels 18 and 19 in an upcoming release. Demographic & Lifestyle Maps—We added 20 more countries, bringing the total to more than 120 countries. The Demographic & Lifestyle Maps group features maps using the latest demographic data from Esri and other sources. You can browse maps about household size, purchasing power, population density, and more. Dark Canvas Basemap—This new basemap is currently in beta at small scale (~1:577 k), and we will update it and expand coverage to larger scales worldwide in upcoming releases. The Dark Canvas basemap was developed from the Light Gray Canvas basemap and gives you the opportunity to use a different type of color palette for all kinds of maps, from locator to thematic maps. World Topographic Map—New and updated content received through the Community Maps Program was added to the World Topographic Map for Europe, the Arabian Peninsula, Canada, and the United States. New content for Europe at ~1:9 k scale includes contributions for Galati and Oradea, Romania. Updated content for Europe at ~1:9 k scale includes the Netherlands and Albertov University and Masaryk University, Czech Republic. Content updates were also made for Switzerland and the Principality of Lichtenstein at ~1:36 k scale and the United Kingdom at ~1: 577 k scale. For Kuwait, we made a content update at ~1:577 k scale. Content for Canada includes 17 new and 52 updated contributions for municipalities, cities, and universities. New content for the United States at ~1:9 k scale was contributed for Tulsa, Oklahoma. Content was updated for the following cities, also at ~1:9 k scale: Carrboro, North Carolina; Chatham County, Georgia; Chula Vista, California; Oregon Metro, Oregon; Mecklenburg County, North Carolina; Dedham, Massachusetts; and Old Dominion University, Virginia. For a complete list of all contributions to each of the world maps, visit esri.com/contributors.